After the sadness of the bleeding baby blanket, I have the joy of the finished Baby Surprise Jacket. I used Rico Design Baby Classic DK, which was left over from the blanket that was ruined. I still love this yarn, I will just never order the red again. Cute huh? I am really pleased with how it has turned out. I had forgotten quite how it was constructed so the striping was pure guesswork. I'm so pleased the stripes ended up looking deliberate! I do love how this pattern is constructed, with the top of the sleeves being the only seams. It makes the knitting so much fun as the shape is created, and you wonder "how is this thing going to actually work". I'm also really pleased with buttons, which I got from Mary Clare. 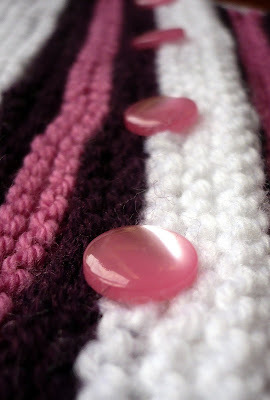 They are a lovely delicate pink, which softens the punchy pink and deep purple knitting. Aren't they sweet. I am really pleased that this baby jacket isn't a girly pink, as I think the parents will receive more than enough pastel pink stuff to last any baby. This jacket is definitely pink, so as to avoid gender confusion, but not sickly sweet. I am pleased with the outcome. In fact, I liked this jacket so much, my WPC 2011 Challenge photo this week, was a shot of the buttons. The subject this week was Repetition. I don't think there is anything more repetitive than knitting do you? The subject next week is Fear, what do you think, lace yarn and a complicated pattern as my photo? For those people who adore this knitting pattern as much as I do, you can order it from Schoolhouse Press (you need to scroll down quite a long way). It costs $10 plus p&p, which will add up if you are not in the US. However the pattern is for baby, child and adults. The pattern is sadly not available digitally. I have to say though, you WILL knit this pattern again and again. As it is a Friday I am hooking up to Tami's Amis for FO Friday, Fiber Arts Friday at Wisdom Begins in Wonder and Fibers on Friday at Visions of Sugar Plums. All three linky parties can be reached by clicking on the buttons below.